If you follow me on Twitter or Facebook, I'm sure you've mentioned me mention Citrus Lane. I am in love! Citrus Lane is a monthly subscription service that provides products for babies, toddlers, preschoolers (up to age 5). They usually even throw in a little something for mom! When I first heard about this, I thought, I don't need any more toys in my house, but this month proved that it is so much more than toys! We received our January box today. 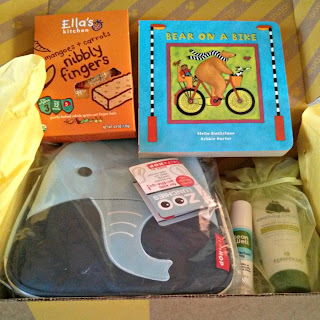 This is our second box in our subscription and I couldn't be more thrilled! So $40 worth of stuff for $25 or less! I have been eyeing the Episcencial line at Kelly's Closet for a while now! So this was perfect timing! I'm hoping this cream will be great on my son's eczema I can't tell you how in love I am with the lunch box! I love Skip Hop! I think all of their products are absolutely adorable. We have one of the Zoo Backpacks and this lunch box is just as cute! I'm excited about the book because honestly, can you ever have too many books? My original plan when signing up for Citrus Lane was to save some of the items as gift items to use throughout the year. Honestly, I want to keep everything in this box! It's such a great assortment of products! You can check out what was in my December box and sign up to receive a box of your own in February! Your box will be individualized to fit your child's age and gender. Boxes are for newborns, up to age five! Boxes start at $25 a month or you can sign up for a subscription and get them for as cheap as $21 a piece! Use coupon code TAKEHALF and get your first box for $12.50! Plus, you'll get a $10 credit when you sign up through my link! Do you use a monthly subscription service? Which ones do you like? I'm so jealous that yours arrived before mine!!! It's sitting at the post office RIGHT NOW!! !